The treatment indicated for a dentigerous cyst is dependent on the size of the lesion. Smaller lesions should be surgically enucleated, avoiding damage to the involved permanent teeth. 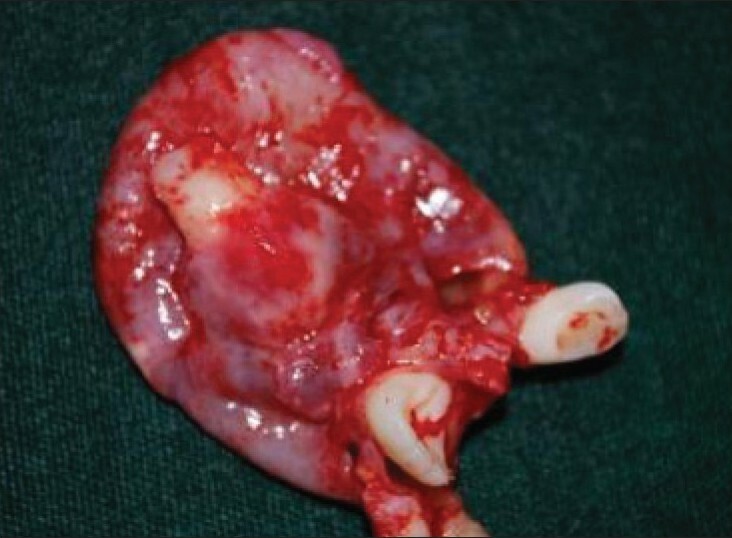 Larger cysts may be treated by marsupialization. Possible complications include permanent bony deformity, or pathological fracture from its expansive destruction of bone, loss of essential permanent dentition or its innervations or development of ameloblastoma or epidermoid carcinoma from the epithelial lining of the cyst. 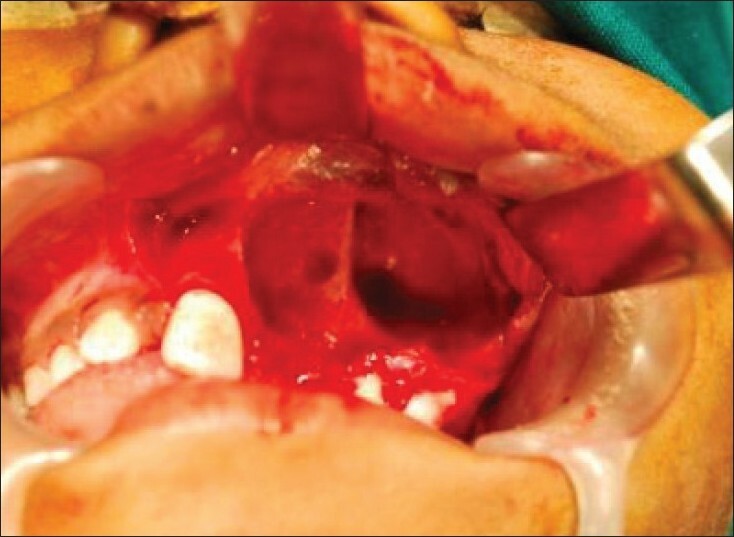 This article reports the case of a dentigerous cyst associated with permanent central incisor, which developed secondary to trauma to the predecessor primary incisor. A 9-year-old boy reported to the Department of Pedodontics and Preventive Dentistry, College of Dental Sciences, Davangere, with a chief complaint of progressive, painless swelling in the left maxillary region since 15 days. History revealed that the swelling was noticed 15 days back which increased in size but suddenly subsided in 2 days. Later, the swelling reappeared and increased progressively. 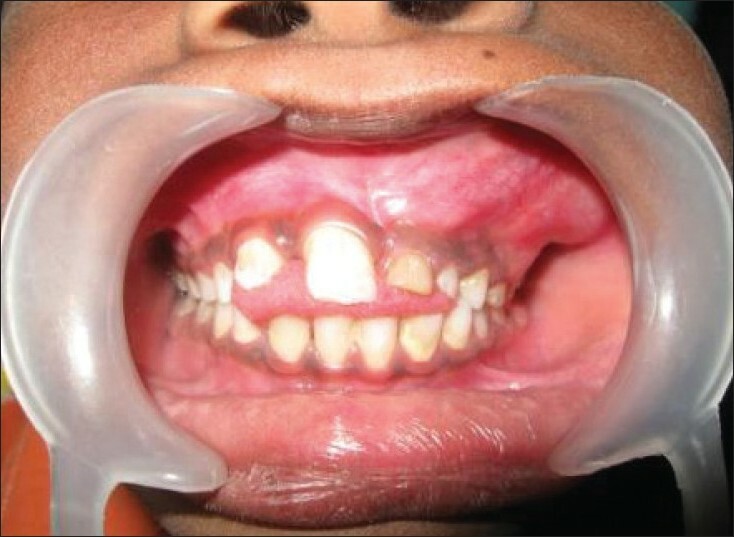 The patient reported history of trauma to the front teeth before 1 year. On general examination, the patient was apparently healthy with no significant past medical history. 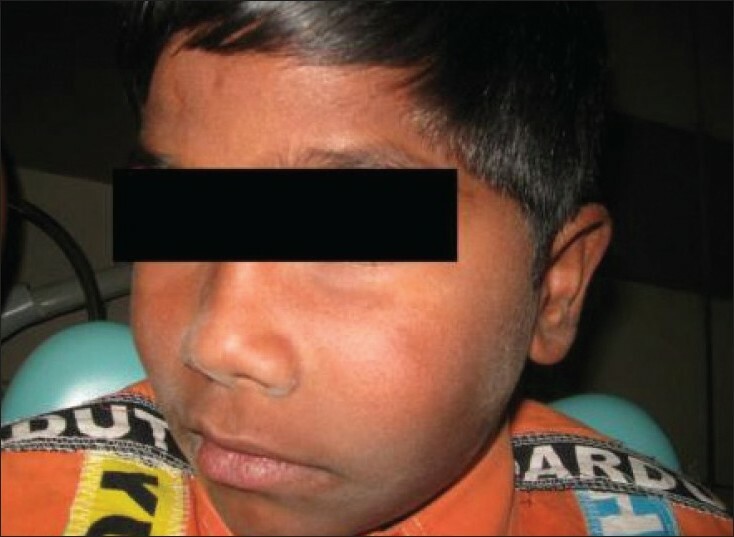 Extraoral examination revealed asymmetric face with a diffuse swelling extending anteroposteriorly from the midline to 3 cm anterior to the tragus of the ear and superoinferiorly 2 cm below the infraorbital margin to 3 cm above the lower border of the mandible [Figure 1]. The nasolabial fold was obliterated. Intraorally, a solitary, oval shaped swelling was noted, measuring about 3 × 4 cm, extending from labial vestibule of the upper left deciduous central incisor to buccal vestibule of the left permanent first molar [Figure 2] The swelling was non-tender, cystic in consistency. The borders were well defined. There was no bruit or pulsation. The buccal cortical plate showed slight expansion and the overlying mucosa was slightly inflamed. Hard tissue examination revealed retained deciduous incisors (61, 62) in the maxillary left quadrant with clinically missing permanent successors. Deciduous left central incisor was discoloured and all the teeth in the region of cyst (61, 62, 63, 64) were mobile [Figure 2]. Intraoral periapical (IOPA) radiograph showed a radiolucency surrounding the crown of the unerupted, malpositioned, dilacerated left permanent central incisor. The lateral incisor was horizontally placed. Irregular resorption of the roots of deciduous incisors was seen [Figure 3]. The orthopantomograph showed a large, well-defined, solitary radiolucency involving the crown of permanent central incisor. The permanent canine was pushed posterosuperiorly near the roots of permanent second molar [Figure 4]. Although the maxillary sinus was not involved, the sinus floor was pushed above when compared with the normal side. Fine needle aspiration cytology (FNAC) was performed and a clear, straw-colored aspirate was obtained suggestive of dentigerous cyst. Based on the clinical, radiographic and FNAC findings, a provisional diagnosis of dentigerous cyst was made. However, odontogenic keratocyst, adenomatoid odontogenic tumor and ameloblastic fibroma were also considered in the differential diagnosis. Prior to surgery, routine investigations were carried out whose results were within normal limits. Surgical enucleation of the cyst was carried out under general anesthesia [Figure 5],[Figure 6],[Figure 7]. The cyst was enucleated along with the deciduous central, lateral incisors, and the permanent anteriors of the left quadrant [Figure 8]. The postoperative period was uneventful. 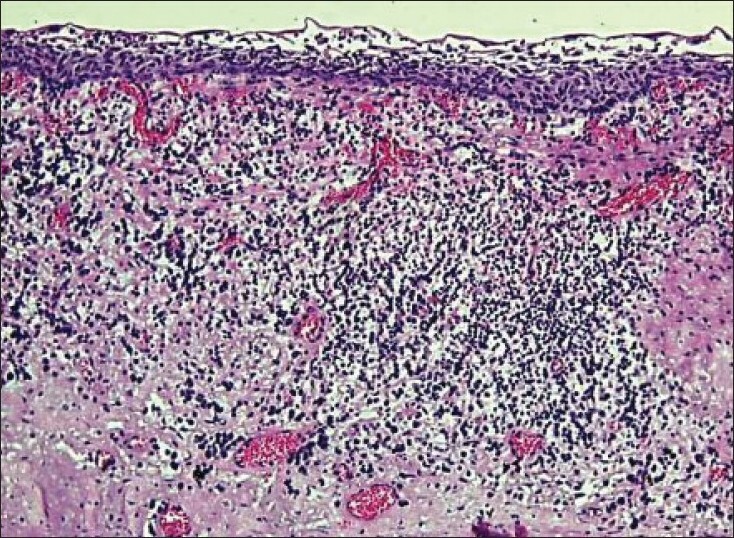 The specimen was sent for a histopathologic examination, which showed a thin, fibrous wall lined by two to three layers of flat epithelial cells resembling reduced enamel epithelium. The connective tissue showed slight inflammatory infiltrate [Figure 9]. After correlating the clinical, radiographic and histopathologic features, a final diagnosis of dentigerous cyst was made. The prosthetic rehabilitation will be carried out after a period of 15 days with a removable partial denture. Dentigerous cyst can be defined as the cyst that encloses the crown of an unerupted tooth, expands the follicle and is attached to the cementoenamel junction of the unerupted tooth. Although the dentigerous cysts account for more than 24% of the jaw cysts, the incidence rate of dentigerous cysts involving the permanent central incisors is just 1.5%. Dentigerous cysts most commonly occur in the second and third decades of life. However, they can also be found in the children and adolescents and show a male predilection. 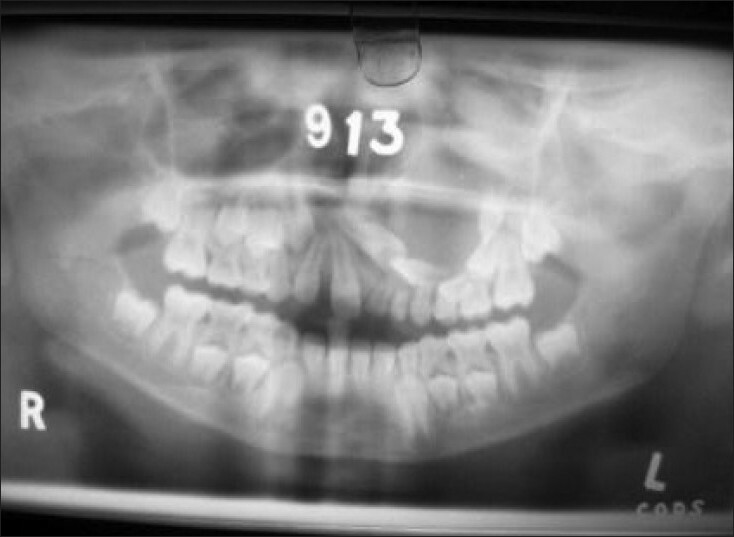 In the present case, the cyst was associated with the permanent maxillary left central incisor in a 9-year-old child. The present case had a history of trauma to the primary tooth. Killian et al. have reported that trauma to the deciduous teeth can lead to odontogenic disturbances ranging from hypoplastic defects of crown to even cyst formation associated with the permanent tooth. Hence, in the present case, trauma to the primary teeth could have caused the development of the cyst. Odontogenic keratocyst, adenomatoid odontogenic tumor, and ameloblastic fibroma can mimic a dentigerous cyst. A suspicion of other lesions can arise when the follicular space is larger than 5 mm in diameter. However, a positive aspirate ruled out the possibility of a tumour in the present case. Many dentigerous cysts reach great dimensions before being diagnosed. Also, displacement of the teeth is relatively common. In the present case, there was a thinning out of the buccal cortical plate and the sinus floor was raised. The canine was displaced posterosuperiorly near the roots of permanent second molar. The present case involving a 9-year-old boy is consistent with the findings by other authors. It is relatively very rare having been associated with a permanent maxillary central, lateral incisors, canine involving three permanent teeth in the first decade of life. Dentigerous cyst associated with such a tooth can cause problems related to the eruption, and hence leads to esthetic and orthodontic problems. Further esthetic management has to be considered to prevent any psychological trauma to the child. Trauma to the deciduous teeth should not be overlooked since it can result in development of any pathology which could indirectly affect the permanent successors as seen in this case. Hence, a regular visit to the dentist helps in early detection, diagnosis and treatment, thus avoiding any morbidity. 1. Kalaskar RR, Tiku A, Damle SG. 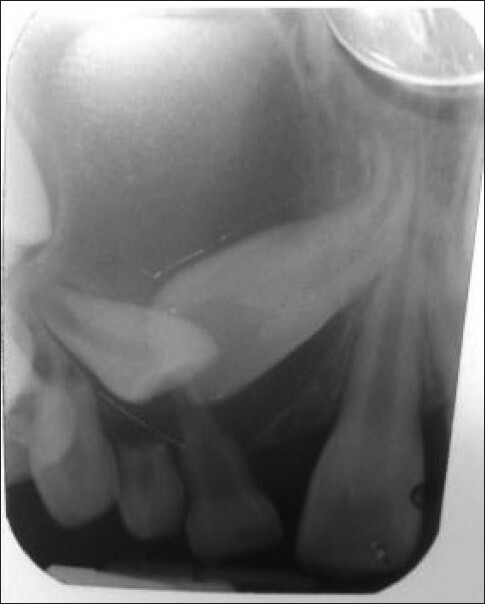 Dentigerous cyst of anterior maxilla in a young child - A case report. J Indian Soc Pedod Prev Dent 2007;25:187-90. 2. Boyezuk MP, Berger JR. Identifying a deciduous dentigerous cyst. J Am Dent Assoc 1995;126:643-6. 3. Desai RS, Vanaki SS, Puranik RS, Tegginamani AS. Dentigerous cyst associated with permanent central incisor - A rare entity. J Indian Soc Pedod Prev Dent 2005;23:49-50. 4. Naclério H, Simões WA, Zindel D, Chilvarquer I, Aparecida TA. Dentigerous cyst associated with an upper permanent central incisor: case report and literature review. J Clin Pediatr Dent 2002;26:187-92. 5. Gondim JO, Neto JJ, Nogueira RL, Giro EM. 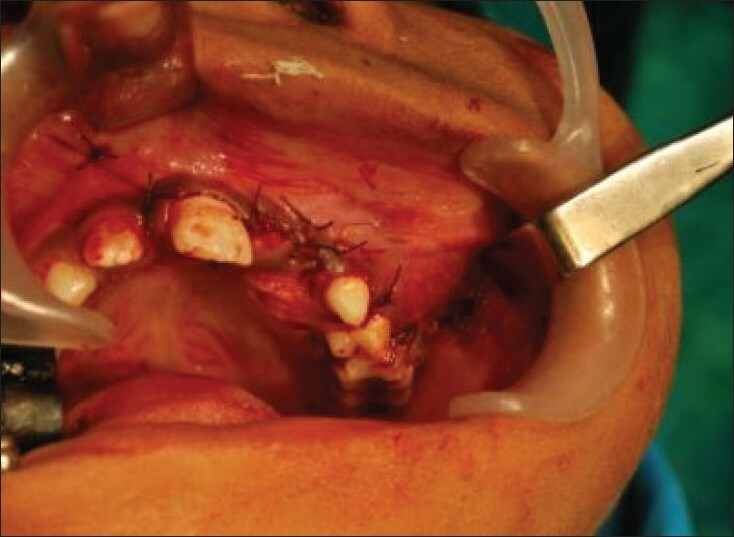 Conservative management of dentigerous cyst secondary to primary tooth trauma. Dent Traumatology 2008;24:676-9. 6. Delbem AC, Cunha RF, Afonso RL, Bianco KG, Idem AP. Dentigerous cyst in primary dentition- Report of 2 cases. Pediatr Dent 2006;28:269-72. 7. Killian CM, Leventhal PH, Tamaroff JL. 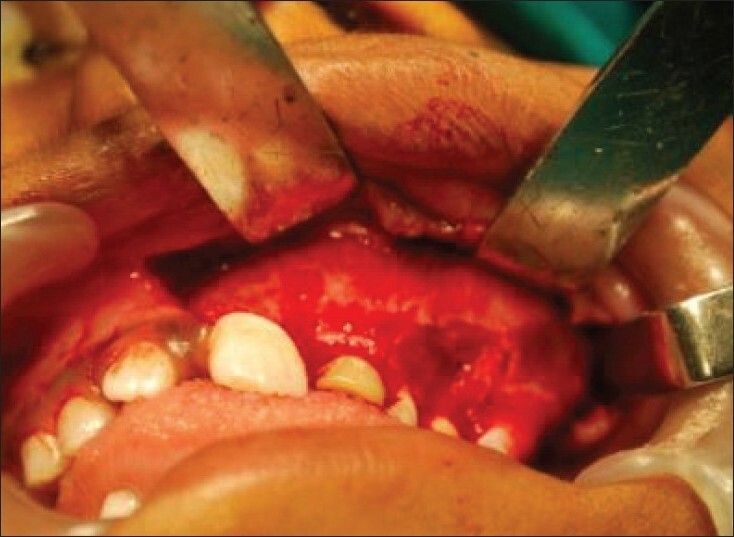 Dentigerous cyst associated with trauma to a primary incisor: a case report. Quintessence Int 1992;23:683-6. 8. Counts AL, Kochis LA, Buschman J, Savant TD. An aggressive dentigerous cyst in a seven-year-old child. ASDC J Dent Child 2001;68:268-71. Agarwal, R.K. and Sharma, P. and Gupta, I. and Patil, R.U. and Singh, S.K. and Bharath, K.P.